Munich - It really has been quite a year for FC Bayern München. After winning the treble at the end of last season, the Reds have since lifted the UEFA Super Cup and shot to the top of the Bundesliga table, winning the Herbstmeisterschaft along the way after Matchday 16's 3-1 victory over Hamburger SV. There is no time to rest on those laurels however, as before the year is out, Pep Guardiola's men want to get their hands on yet another trophy: the FIFA Club World Cup in Morocco. Central to their success has been the form of French international and 2013 UEFA Best Player in Europe Franck Ribery, and in an exclusive interview with bundesliga.com, the 30-year-old expanded on his wish to cap a fantastic year for the German record title-holders by winning the competition in North Africa. bundesliga.com: Monsieur Ribery, Bayern have now won the Herbstmeisterschaft with a game to spare. You will no doubt be full of confidence going to the Club World Cup in Morocco. Franck Ribery: Yes, definitely. After losing to Manchester City in the Champions League on Tuesday, it was important to respond immediately. The win has done us good. bundesliga.com: Just as against Manchester City, you seemed to struggle at times against HSV. Why do you think that was? 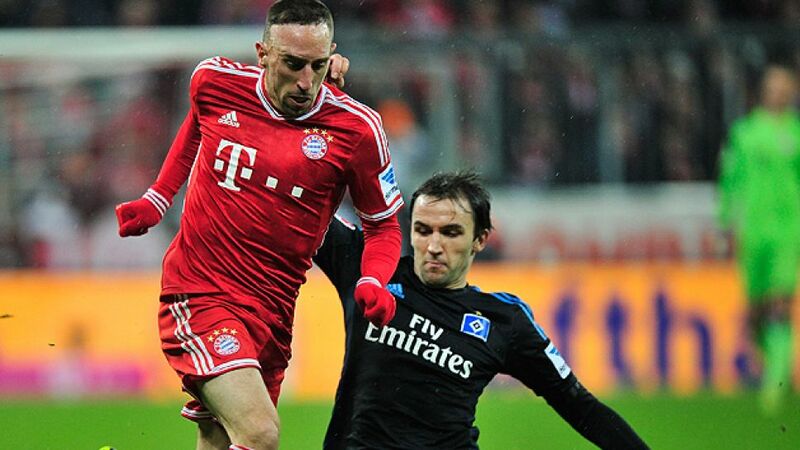 Ribery: We can’t always dominate the opposition. What counted against Hamburg was the three points so that we could make sure we stayed top of the league over the festive period. We managed to do that, now we’re autumn champions and we can be proud of that. bundesliga.com: You have two more games to play and then comes the winter break. Has it come at the right time for you? Ribery: Absolutely. The team is a little bit tired. We’ve had a lot of important matches this year but we want to focus all our efforts on winning the Club World Cup. That’s our target at the end of this perfect year. bundesliga.com: The Club World Cup is a completely new tournament for this team. What are your ambitions going into it? Ribery: We want to show that we’re not just the best team in Europe but also the rest of the world, and to do that we have to win these two matches. But I’m in good spirits because we’ve had a fantastic year. We’re all completely focused on making it even better. bundesliga.com: In the semi-final, you’re up against Chinese side Guangzhou Evergrande, coached by World Cup-winning manager Marcello Lippi. What do you know about them? Ribery: To be honest, next to nothing. But that’s normal. We’ll still concentrate on our strengths and try to impose our game. If we play like we have done in the last few weeks, then we’ll pass the test in Morocco. bundesliga.com: Bayern are very popular in Morocco. What type of atmosphere are you expecting? Ribery: I’m really looking forward to seeing Moroccan fans. They love their football and I’ll do whatever I can to give them some entertainment. A lot of Moroccans will be supporting us there. bundesliga.com: Is this Bayern team stronger under Pep Guardiola than you were under Jupp Heynckes? Ribery: Pep Guardiola is an unbelievable coach. He’s very close to the team, he talks a lot with us and gives us a lot of confidence. He’s always positive, never criticises us and I have a very good relationship with him. Since he’s come in we’ve definitely progressed. bundesliga.com: What specifically makes him such a good coach? Ribery: There are lots of things. For example, if he notices that we’re finding things tough in a game, he always knows how to find the best solution. Tactically he’s very clever. If I think back to how well we played away at Manchester City in the Champions League, then you can see that he’s a brilliant coach. We’ve watched that game a fair few times since and noticed how well we moved the ball. It was just perfect. bundesliga.com: What have new arrivals Mario Götze and Thiago brought to the team? Ribery: Right now we’re happy that they’re both fit. I think above all they bring so much technical ability to the team. They can do everything with the ball and they play without fear. Both Mario and Thiago have been great additions for us and they’ve both fitted in really well. And now we’re less predictable than ever.